So, I was washing some radishes the other day and I looked out our back window to find 2 adult turkeys and six little ones. I’m pretty sure it’s two females and their babies but I’m not sure. Do they travel in packs? I yelled to my little man to come over and look. I lifted him up onto the sink and we started discussing them. “Look, a squirrel is with them” I said. “Yeah, a sqwirrel” said Little Man. “They’re so close, it’s so weird” I said. “Awwww, so tcute turkeys” (that’s how he pronounces cute). It was the cutest thing ever! Anyways, back to the radishes I was cleaning. My mom stopped at the farm stand the other day and picked up some radishes for herself, then dropped a few off to me. 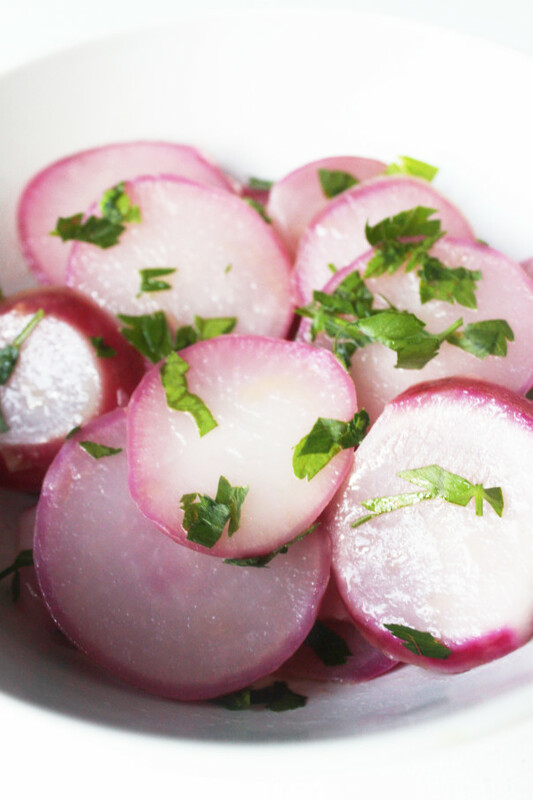 I personally haven’t eaten many radishes over my lifetime but I’ve been wanting to grow them for years because they have a short growth cycle (like 20 days). 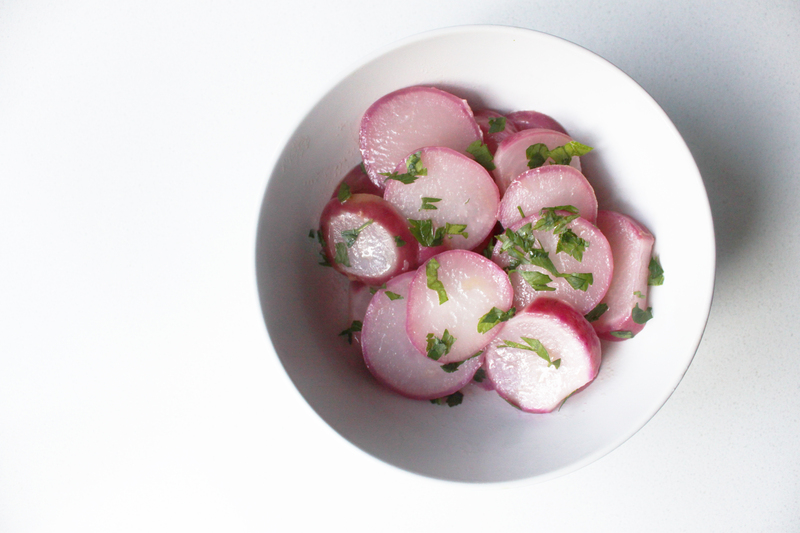 I decided to take this opportunity to try cooking them as I have a friend who insists that buttered radishes delicious. I decided to cook them in water because my mom insisted that it takes out some of the bite. 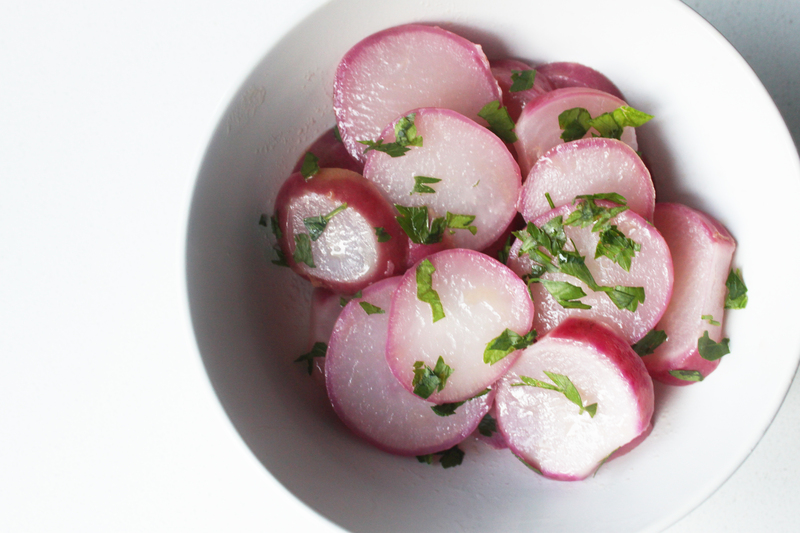 Once cooked, the radishes were pretty good. Not to die for, but decent enough to make again. I feel like I always see people getting radishes in their CSA baskets, so if you have an abundance of them, throw this in your meal plan.